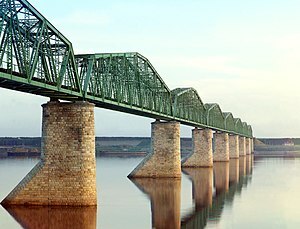 The Trans-Siberie Railwey (TSR, Roushie: Транссиби́рская магистра́ль) is a network o railweys connectin Moscow wi the Roushie Far East an the Sea o Japan. Wi a lenth o 9,289 km (5,772 mi), it is the langest railwey line in the warld. 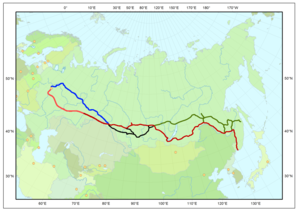 ↑ "The Trans-Siberian Railway – the second longest railway in the world". January 31, 2011. This page wis last eeditit on 30 Juin 2017, at 02:48.